Zheng Jie was excited when he saw Chinese athletes wearing outfits produced by his company at the closing ceremony of the 2018 Pyeongchang Winter Olympics. “Our brand caught world attention at the grand event, which has greatly increased our brand exposure and improved our product image,” said Zheng, president of ANTA Sports Products Limited. ANTA, an official sports equipment partner for Chinese athletes at this year’s winter Olympics, which was established in 1991, is a leading company in China’s sports products industry. 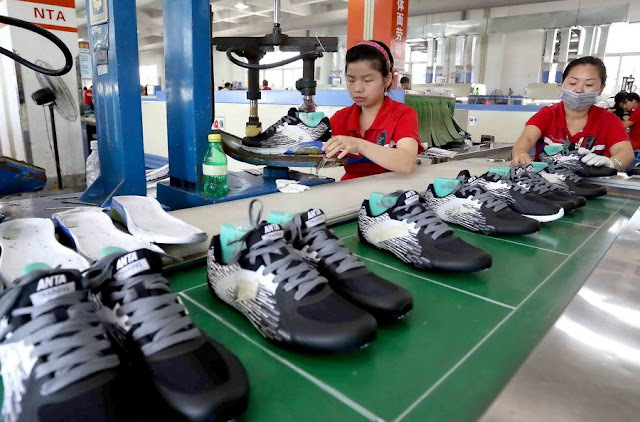 In 2017, the company sold 60 million pairs of shoes and 80 million pieces of clothing, with annual revenue reaching nearly CNY16.7 billion (USD2.6 billion), maintaining 20% annual growth for four consecutive years. Ding Shizhong, chairman of ANTA, attributed the company’s sound performance to its intelligent manufacturing plants, modern logistics and supply chain systems, and enhanced cooperation with overseas sports brands. ANTA said it had built a group of clothing and shoes R&D centers in countries such as the United States, Japan and South Korea. It also expanded its portfolio into several international brands, including Fila, Descente and Sprandi, to meet the demands of different consumers. “All these measures greatly bolstered our company’s market performance,” Ding said. In January 2018, ANTA Sports’ market capitalization exceeded HKD100 billion (USD12.8 billion), ranking the third in the industry globally after Nike and Adidas. China’s sports industry has grown rapidly over the past years, with a total output of CNY1.9 trillion in 2016, according to the figures jointly released by the General Administration of Sport and the National Bureau of Statistics in January. By 2025, the scale of the market is expected to reach CNY5 trillion, according to a government plan. China will build a collection of domestic sportswear brands with strong competitiveness in the global market. It is an inevitable trend for Chinese brands to enter the global market in the long term, an analyst from Guosheng Securities said. Innovative efforts in product design and material are of increasingly importance to meet global challenges. China is a huge market with tons of suppliers and not every one of them is as famous as ANTA. So how do the global buyers choose the right supplier? As one of the leading global supply chain platform, eGTCP has just the perfect solution for you-- 6C Supplier Recommendation. 6C Supplier refers to the supplier that has been verified by eGTCP.com in 6 categories (Commodity, Company, Contact, Certificate, Credit, Customized) and proved to have good credit status and production capacity after field investigation. Join us now to get FREE 6C Supplier Recommendation and make your trade easier, safer and faster! For more details, please contact staff or visit www.egtcp.com.